As part of the 2018 Bangor Humanities Day events on Feb.3, UMaine students displayed their art at COESPACE in downtown Bangor. Photo by Ian Liggett, Staff. On Saturday, Feb. 3, downtown Bangor hosted many free events celebrating literature, art and music during the sixth annual Bangor Humanities Day. The celebration kicked off on Friday evening with a Humanities Powered by PechaKucha event at COESPACE. PechaKucha is a presentation style where 20 slides are shown for 20 seconds each, keeping presentations concise and fast-paced. Topics of the evening included: making a living as an author, medical ethics, the Maine Multicultural Center, wedding perfection hysteria and bacteriophages. The McGillicuddy Center collaborated with the University of Maine Museum of Art (UMMA), Bangor Public Library, Maine Discovery Museum, COESPACE and Nocturnem Draft Haus as host locations for the Bangor Humanities Day events. Many organizations contributed as event partners, such as the UMaine Department of Art, Bangor Public Library, Bangor Symphony Youth Orchestra and the Happenings Series. The Bangor Public Library hosted three events throughout the day. At 12:15 p.m. in the Library Atrium, live Irish and Scottish songs were performed by a local Celtic Quartet. In the Crofutt Room at 1:15 p.m. there was an informal panel to discuss the broad range of grants that are available for public cultural programs. Folklore archivist Katrina Wynn held an oral history workshop at 2:15 p.m. in the Library Business Center, to teach the basics of conducting oral history recordings. Nocturnem Draft Haus hosted a Poetry and Prose Reading at 3:15 p.m. as part of UMaine’s “The Happenings Series,” a multidisciplinary and genre-fluid creative events collective. The last event of the evening was hosted by the UMMA, which offered tours of the gallery’s new collections given by the UMMA director George Kinghorn, as well as appetizers from Basil Creek Catering and a cash bar. In addition to these events, many other activities took place throughout the day: a downtown cultural scavenger hunt with prizes given out at 6 p.m. at UMMA, a StoryWalk featuring local author Lee DeCora Francis’ “Kunu’s Basket: a story from Indian Island” and a University of Maine student art show at COESPACE. 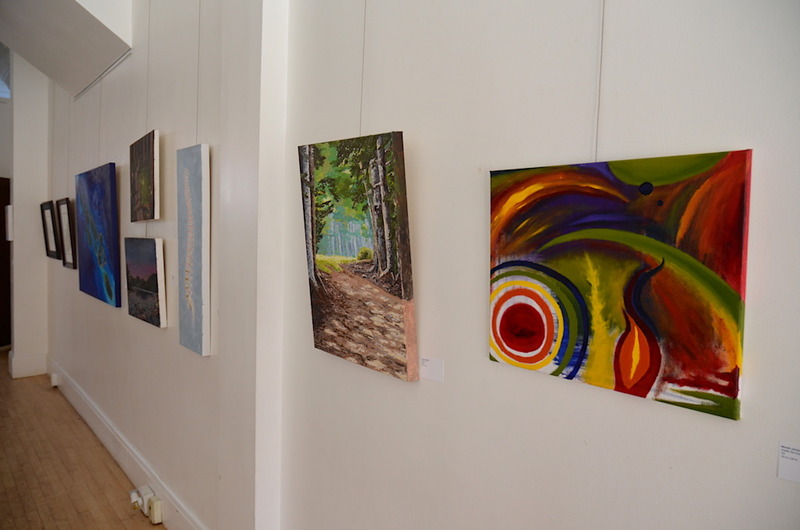 The show featured over 20 works from students enrolled in Ed Nadeau’s Painting II and III courses. In class, his students are continuing to develop painting concepts while placing emphasis on the characteristics of materials. Through special projects, the students are being encouraged to tackle technical and expressive issues in the hopes that it will lead to personal growth. The Bangor Humanities Day student art exhibit showcased an array of new challenges and learning experiences. Ariel Goos, a fourth-year student studying studio art, and Jane Parlee, a third-year student studying art education, were featured in the exhibit. Goos’ work included both a natural landscape, titled “Orono Bog Walk,” and a more abstract piece, titled “Blue Abyss.” Parlee’s pieces titled “Fireflies in Acadia” depicted a natural and whimsical national park. Parlee’s perspective on the experience is slightly different from that of Goos, due to the difference in their degrees. However, Parlee found it equally challenging and thought-provoking. Next winter, look for Bangor Humanities Day’s list of scheduled events celebrating culture and the arts in downtown to have an opportunity to experience this celebration first-hand.